← Ezra Levant’s “Ethical oil” is a bad joke. When you are watching gold prices, remember this chart. Maybe you don’t, because you don’t own gold and you think it’s a barbarous relic like that Roubini, so you would never want to buy it. But if you aren’t like Roubini (and most other people), you should care. Basically, this chart shows that during the last two years of gold fever in the 70s, there were seven corrections that averaged 10%. You have to remember that at this time, gold interest was really intense. At present, gold interest is still very low. The important point is that although we are in a significant bull market for gold, volatility is not abnormal. I wouldn’t necessarily be alarmed if gold fell 15-20% — in fact, such a situation would present a great buying opportunity. This doesn’t mean you should sit and wait for such a correction — it might not happen to that extent. The biggest correction we’ve seen in 2011 was 6.2% in January. 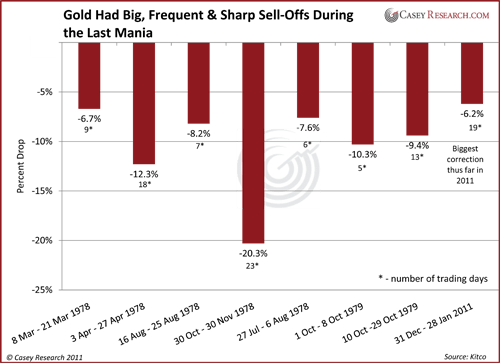 Instead, the main point of this chart is that while we are in troubling economic times, there will be moments where weaker players are nervous and eager to sell their gold. Just don’t sell yours.